Fast forward a year later.... I still don't understand tax code any better, I HATE what options -small business owners especially!- have when it comes to health care and you know what? It's alright. I started my business when I was 18 so in a lot of ways, I've been "adulting" for a while, learning life experiences each and every day in conventional and non-conventional ways. We all grow up differently, assume responsibility differently, take journeys differently and be creative differently. In my opinion, we should never outgrow the wonderment and curiosity of childhood, while at the same time we should always strive to capture life's wisdoms as we embrace adulthood. If age is just a number, do you mind if I stay an old soul, perhaps born for a different time but living in this day and age? So here we are at another January. The time when aspirations run high and I at last, have precious time on my side. It's when when I do what I love best- review the past, plan for the future and be creative! I've spent a lot of time working on projects lately- class samples, personal projects (SAY WHAT!?!) and creative endeavors and that leaves me with some tv watching time. I haven't had tv "programming" since we moved to the farm when I was 12, so that's 18 years, I suppose! I kind of lost track of that, but its almost two decades not really knowing any of the Superbowl commercials people were talking about, or what reality show star was making headlines or knowing who America's funniest, prettiest, fattest or craziest people were. My family eventually ended up with a VHS player, then a DVD player, and we did watch a lot of movies. With the invention internet television- aka Youtube and Netflix- we now have the convenience of watching anytime, anywhere. I didn't miss it, to be honest- we read a lot books and did a lot of chores...lol. Lately, I've been watching a lot of Netflix while I felt, and been on quite the kick with British shows... The Great British Baking Show, Call the Midwife, The Crown and The Paradise to name a few. I've come away with some touching observations that might inspire you, and I've discovered a common thread in them that has energized me. The Great British Baking Show is all about baking perfection- in a friendly, encouraging competition- in which things must taste and look their best whist prepared under time and pressure. I've learned so much, even though I'm not really a baker, more of cook (I hate measuring anything!). But what did I learn most of all? Baking is a lot like my art- attention in the smallest details, much repetitive work, give an eye for a clever and unusual twist, and present it as though you believe in it. With that recipe, you know anything you do will be "simply scrummy" (a phrase I'm afraid I'm coining for life)! Traveling back to a time not too long ago, but in a time when the world was changing swiftly, was Call the Midwife. This series I did not want to like, simply because my mom was into it. Besides, who wants to entertain themselves with hearing women in labor for a cliffhanger-55- minute-episode? Not me, I thought until I saw how it was so much more than that. What I saw was a caring, compassionate group of women. They came together from many backgrounds and united the community with their tender ways and loving hearts. They showed what it was to experience sorrow and joy on life's path and how to stay strong in spite of it all. While on the other side of London midwives were dealing with the blood, sweat and tears of life, The Crown dealt with the life of the royal family and the great task it was for the young Elizabeth to become Queen. The blood, sweat and tears were all there, no doubt, as a young couple, hopeful of raising their family and living their lives the way they dreamt, was suddenly thrust into an upheaval. It wasn't supposed to be this way, I'm sure they thought and wished. Yet they pushed through it because they had to, out of loyalty not only to their family but their country. They learned a great deal about themselves and each other out of the struggle, and to watch the both of them, as well as Elizabeth herself, emerge as from a cocoon is inspiring. I also was intrigued by much of the history, which I love, and how it overlapped with Call the Midwives in the subtlest of ways. The Paradise tells of a passionate business owner, one that takes great risks and schemes grand ideas for his department store. Alongside him comes a young lady, though rural in upbringing, has a keen skill for business. She catches his eye, as well as the disdain of many who work with her. Her sweet spirit and tenacity rise above it all and both of them find ways to be creative, meet the changing tides, reinvent the status quo and embellish the ordinary. They are bold and confident, the way any business owner should be, in spite of all the challenges they face. I'm reading a book my husband bought for me for Christmas, Rosalia's Bittersweet Pastry Shop, about an Italian convent that bakes world-renowned pastries and has a mysterious story. The Mother Superior is opening her bakery, and herself, to an American food writer who is pairing up to jointly publish a book. There are even recipes in the book, so I'm looking forward to trying some! It takes me back to my time in Italy, and the culture, food, way of life and beauty. When I reflect on the things I've taken away from these stories, I'm energized by the incredible women who made their mark on the world by doing something they were passionate about. It gives me the faith, that I too can walk in their footsteps. They faced adversity, challenges, and discouragement but they believed in their talents, in their skills and in themselves. They had people around them that supported them. So this January, that is the message I'm taking into the coming year. 2018 is going to be a year of committing myself again to the passion to which I've been called to, giving it my all. Cheers! Being an artsy person, the holidays roll around and I just start getting all Martha-Stewart-inspired to have things perfect. The perfect decor. The perfect food. The perfect bakes. The perfect wardrobe. The perfect gifts. Heck! The perfect wrapping on those gifts. Everywhere we look we see photo-shopped images of sheer holiday perfection, leading us to believe we can pull off what a high-quality camera lens, a few product designers and dozens of little minions in the background do to make that moment happen. In reality, its a set up for disappointment if you ask me. I have been there too many times, too many years. There's traveling to be had, families to eat, drink and be merry with. You feel the urge to get in touch with all those friends, via parties, greeting cards or gift giving. As the weeks and days count down for Christmas, we honestly don't know how to squeeze in another place to be and another social engagement. I yearn so much for a genuine experience, rich with tradition and sincerity. I find it fulfilling teaching many fun classes where I get to see memories being made, and laughs and smiles on all the faces. Just this season, I believe we have made over 50 twiggy reindeer in classes! I am a part of secret keeping, making special gifts appear under the tree and fun surprises I can share with all of you. It is very rewarding, but I find myself running up until the very hour of Christmas and feeling breathless as I try to put together the "perfect" holiday for my family. Sitting in church, stressed by this tug in my heart, I listened as we sang the sixth and seventh verses of "O Come O Come Emmanuel"
I began to think about all the things that dwell in my heart at this time of year... of winter, solstice, Christmas, family, traditions and faith. It was like I looked up at the night sky and these brilliant and dazzling stars suddenly started to form a constellation, connecting their solitary beauty into a story. So much of my world revolves around seasons as a farmer, and when you are one with the land, you try to seek out the lessons it holds for you. Though we are sad to see the bounty of fall go, winter is our time for rest and reflection. It is really a welcomed season in its own serenity and solitude. Welcoming us into winter, is the beauty of Advent. It really illuminates the dark winter days ahead. It gives us the joyfulness of celebration, and the wonderful traditions we know and love. It opens our hearts to the winter months ahead. When I realized this, I began to see how Christmas is really the beginning of a time to nurture our hearts and souls and the ones we love around us. It's not over December 25th. The glow lasts through the winter months til the Earth begins to thaw and grow again with Spring. It's a way of life for us, and somewhere along the way we've lost that perspective a bit. This year, I've already felt the joy of carrying the awe of Advent forward into the dark winter months. I'm hoping it means more time in my studio, with other creative souls and to dream a little bit. So while the Earth is quiet and restful, my soul shall be too. Merry Christmas! May the awe of Advent be yours to cherish. What hidden treasures will Peter find today in Mr. McGregor’s garden? Carrots of course! He’s been sniffing around for a treasure since he slipped under the gate and into the carefully tended rows of Mr. McGregor’s vegetable box. Beatrix Potter’s imagination birthed a classic we know and love, but did you know what a strong and passionate woman she was as an individual? She took earnings from her book and purchased a farm. Her work in cultivating the preservation of the Herdwick sheep led to her purchasing lands surround her farm and creating open space for future generations. Not only did she capture the magic of her surroundings, but she helped us to fall in love with it and the creations of her dreams. She left her mark in the world in the form of something beautiful and lasting. Her life and story is such inspiration, and she will forever be a role model for ingenuity, artistry, and truly, a hidden treasure. Author’s note: I’d like to thank the dozens of bunnies and the countless vegetables on our farm, Big Rock Organics, that provided inspiration and models for this project. Throughout the season, it planted the seeds for the fruit of this projects as I tended and picked our lovely produce for markets and CSA boxes. In the midst of a busy life, in can be hard to create. I had this conversation with a customer and it made me reflect. Yes, it is hard to find the time to create. Especially for me, Spring, Summer and Fall are times of creating life on the farm. It means early mornings, long days and late nights. My hands get rough and my back aches. In-spite of this, it offers moments of beauty in so many ways. Dewy plants. Mothers nuzzling newborn lambs. Rich colors getting plucked from dark soil. These moments feed my soul in a different way. They go in a reservoir where inspiration draws from for the colors that get painted across my art. Moments get tucked away and become stories such as these I tell to you. Yet the need to create is always there. So I must find the time. Many times, I can only find the time when I instill upon myself a deadline. These make me push aside all other priorities and put my art first. It's really hard to do! Really, really hard to do. So many things vie for attention. However strong the pull, I know that unless I put art first, it will not get done. As I started to create, something wonderful happened. I felt a calmness and yet a surge of energy pass through my system. I found myself thinking less about everything else and focusing on how the fibers felt in my hands. How the colors blended. How rhythmic the rolling was. It took me out of the moment, out of the stresses and transformed me. I was expecting to be stressed by the anticipation of having to create for an upcoming deadline, and instead I found just the opposite effect. We so often cannot find creativity on our own. We need a little nudge. For me it was a deadline. For someone else, it might be coming to a class here at Esther's Place. Others, it might be a knitting group, like our lovely Friday ladies that come to work on projects. In any shape or form, motivation to seek after creativity sometimes comes from outside yourself. So in reflection, I am learning more about myself and my art. But one thing I do know and have always known. Creativity was something planted in me by the Creator of every good and perfect thing. It makes me feel like I'm fulfilling a little purpose in my life, which in turns, brightens my corner of world just a little bit more. Moms can fix just about anything. It's magic, I swear. I don't know where they find this magic power, or how they do it, but they can mend just about every hurt in our life. From a young age, we've been brought up with the notion that if we run to them with our problem, they can fix it. From boo-boos and band-aids, to broken hearts and broken dreams, moms have mended our hurts, our whole lives long. And through it, they've taught us about always having hope and always trying. About a month ago, a neighbor called us at the shop with a request. Their childhood teddy bear was in pieces, could we repair it? My mom graciously said sure, sight unseen. Well she wasn't there the day they brought in this little treasure. They came in and explained it was her baby toy, and was 70 years old. She wanted to have it back together so her grandkids could see it and enjoy it. It was lambswool, soft and wooly and truly unique. It was in pieces. One arm was dislocated, the other arm was simply missing. The face was flapping and the head, well ... to put it gently...was "hinged" . I was afraid the pelt it was made out of was dry-rotted and would start disintegrating if one touched it. I was scared to death to even touch it. This is the stuff nightmares are made of... headless teddies, dragging one arm along the cold bedroom floor, trying to smother you in your sleep. I left it in the bag, and managing a bleak smile, I told them my mom would be in touch. "That darn mom of mine", I thought, when they left. "She's one to commit to something even when she hasn't seen it beforehand. She'll promise the world. And this little project, why, it will become mine, you see, and I'll be left using my creative juices and magic powers to work a healing miracle of Jesus on this ancient relic". I really didn't think there was hope for it. I was afraid of doing more damage to it than help, and I felt like maybe the memories of 70 years should stay with little teddy rather than perform life-threatening surgery. It's like when the doctor says, "Why dear, you are 95. This surgery could make you live another 10 years or kill you". What choice do you make? I explained all this to my mom when she came in and I showed her the teddy. We both flinched a little as it's head flopped back, but she cheerfully said she would fix it. A week later, they brought in the other arm in a little ziploc baggie and now we were starting to look like the laboratory of Frankenstein. Upon examining, it looked like the stitches were a cotton thread that had frayed and broken, and it could be fixed up with some gentle sewing. And maybe a little of the cotton batting would have to be removed for things to fit together once again. Minor reconstructive facial surgery, but what the heck? She shared it with our little stitch group that meets on Fridays and we were split about 50/50. Half were on my team, believing we should preserve the integrity left and not face surgery in it's advanced geriatric state. The other were with mom, believing anything is possible, and while we're at, why not make it more fabulous and knit it a little sweater! Judging by the picture, you can see who won. I will admit, I was amazed. One, to see it in one piece. Two, to see the hope that my mom displayed for such a small little thing. Three, to see how people jumped in with caring hearts and willing hands to touch someone's life. This teddy meant so much more than just a child's toy. It was a lifetime of memories, but most importantly, an example of how moms never give up and always hope, always persevere, always trust the best can come out of every situation. You see, a teddy bear needing doctoring was just like a lifetime of my mom doctoring our hurts. Her whole life has been giving her the skills to be a mender, a comforter, a fixer of broken things. Why did I think a teddy bear would be too much for her to fix? I guess I underestimated those mom super-powers. They are still alive and well, even though her kids are well into adulthood. We'll never lose the need for the mom-fixer-upper in our lives. I actually spend a lot of time on the road. I think last year, traveling for teaching, shows, presentations and more logged about 4500 miles on my lil ol self. That's a lot of sights and sounds, a lot of great tunes and boring ads. You get to see a lot of things that turn your head. Things that make you shake your head. I remember one time seeing a homemade trailer with chickens and you could see their little feathers rattling in the wind from all the sides. Mind you, I was eating McDonald's chicken nuggets at the same time, and slurping a coke, my travel drink of choice. Needless to say, sometimes you see the oddest things. One of the best things I can see is a beautiful sunset on my way home. What this usually means is I've had a long but happy day, seen and met and taught, and now I'm headed back on the road richer for the experience. The smiles and laughs we share, the satisfaction of knowing I've enriched people's lives with creativity, and the joy I feel is a warmth glowing within me. Watching a glowing sun sink into the horizon is just another confirmation that the day has come to a close and the chapter of that day has come to the end. Sometimes when things don't go all so well and there are aggravations at every side, it is just as comforting to know the day comes to a close and there is another chance with a new dawn. This is when I am especially glad to be coming home. Coming home to a place of familiarity and comfort. Coming home to the ones I love. Coming home to a place where I can recharge and rest for a new day ahead. Coming home, away from the chaos of the outside world and into the quiet of my own soul. It means so many things for us. When I see the sun beginning to sink and clouds start to dance into twilight, I am amazed at its' fleeting beauty. There are so many times when I take a snapshot in my mind because it disappears far too quickly. But the ones I do capture show a little bit of what my eye deems unique- light that illuminates and radiates, shadows that envelop their surroundings with shifting obscurity and color that is electrifying. When you come home,capture these moments in your heart and be thankful. After all, as my Dad says, sunsets are really just postcards from heaven. Adventure Yarns: "Lake Michigan Shores"
This picture captures the smooth color transition of sand to sea to sky of the glorious Lake Michigan. Since this is the closest this Midwesterner will get to an ocean, I still find it pretty breathtaking. I've spent many wonderful trips and memories at its' beaches in the summertime, but this picture was not taken in summer. I had a presentation in Chesterton, Indiana in early March. This is near the Indiana Dunes, a place I had always heard of but never visited. The Duneland Weaver's Guild was a fantastically creative group of ladies who inspired me with their handiwork, humbleness and talent. I truly felt in the presence of greatness! After the presentation, a group of us went for local bbq. It's such a nice tradition, as members get to become acquainted with the presenter in a more casual environment. Following our meal, I shared that I wanted to go see the Dunes. A bunch of people piped up with suggestions and directions, but one sweet gal, seeing my perplexed look, offered to drive me to the Dunes and I could follow. Relieved, I gladly accepted. She took me to a little tucked away beach that wound through vacation homes, pretty barren woods, and breathtaking knolls. With each rise, I could see a little peek of the Dunes ahead. When a full view came in sight, it was glorious. Blue skies, sandy beaches and rolling dunes carved out the coastline for miles. I thanked her, got out and zipped up my parka. It had to be at least fifteen degrees...so here I was in a down parka, with my fur hood up, gloves on, trekking through the sand. Biting cold was no match for me, I told myself. With a sky so clear and a blue so deep, you couldn't miss out on this. I could see Chicago's skyline across the water! It was so nice to see this beautiful sight, even if in chilliest of circumstances. I decided I had to have that "foot selfie" everyone gets at the beach, so I posed by boots in the sand. Deciding the sun was at the wrong angle, and thinking how much more awesome the photo could be if my feet were in the water, I turned my back to the water and waded in a few feet so I could capture the light on the light lapping waves. Camera posed and ready, I waited for a gentle wave to roll up and snap! Well that wave wasn't so gentle and it went OVER my boots. Yes. I now had wet socks and wet boots and a two hour drive home. Ahhhh..... but that picture was worth it, I told myself. And the moment. And the memory. And the fact that it inspired beauty that will inspire you. Sometimes life is just like that. When we are trying to get it perfect, a wave comes up and takes us by surprise. Yet we take it all in, as part of the process. The moment and the memory will be worth it. Trust me. Tonight the sky quickly changed. I was in the garden, before sunset, trying to finish some hoeing before night fell. There was a lot on my mind... the picking day that lay ahead, the work that always loomed, the problems that I couldn't solve. I was overwhelmed. As I looked at the rapidly moving clouds to the north, I wasn't sure if we were going to get rain or not. As the minutes raced by, I knew it was heading our way. I was trying to overcome the discouragement and feeling of not being able to get ahead. Another storm? Really? My life had too many storms thus far. I was tired and worn out and as this one approached on the horizon, I glanced up to see the sky change to a radiant gold. Rain fell in soft splitter-splatters on my back, and in a brief moment, it began to pour. I had a sinking feeling. Another storm, another set back. Something nagged at me to turn around. When I did, I was facing the most glorious rainbow- a double rainbow, in fact with a full spectrum of color. Those who know me know how much I love my color spectrum and this was incredible! Right away I burst into tears of joy. It was like God had whispered "I am here. Turn around. Don't face the storm. I am right behind you." And just like that, the rainbow grew and grew and grew. I dropped my hoe and started to run to the edge of the garden to get a picture. I could barely get the whole thing in one picture because it got so large so quickly. It was like He was telling me, "So can you trust me in the storm? I am bigger than the rain that pelts you. I am more glorious than you ever know. And I love you enough to tell you this. See my beauty? I am right here, and I want you to know that." The rainbow lasted for only a few brief moments. When I turned back around, the storm clouds had broken into a Renissance-esque scene of sunrays bursting through heavenly clouds. I whipped my head back around to see the rainbow disappear, leaving only a peaceful wash of color in the sky where it once was. It was a moment as real to me as if God had spoken in audible words. It is something I will cherish for a lifetime, and something I hope, that in sharing with you, offers hope and encouragement for the storms you might face. Turn around. You might just find a rainbow there! I am ecstatic to have finished this and thank you to everyone for following my journey! No, none of these monumental things did I accomplish. Yet, in so many ways, the finishing of my sweater seems somehow to be a feat nearly as insurmountable and yet here we are! I finished my sweater after a long four years. Now that I have finished it, I am not taking it off. I have worn it for five days straight. I hope my husband doesn’t mind looking at that sweater because he is going to forget what the rest of my clothes look like. That sweater fits so nicely, is such a fun breakout color from my usual shades, and is uber warm. We’ve had a dip into deep winter temperatures and it’s been my lifesaver. I don’t think I’m taking it off til Spring! I learned several life lessons with this sweater, and now that I’m on the other side, I feel as though sharing these lessons might be helpful. Whenever we come out on the other side, we have tales to tell of the journey. First off, do not put down something you love for a long period of time. My beloved sweater had many long spells where I did not pick it up for months and even years at a time. It was so bad, that at one point when I had an inkling to work on it, I could not find the pattern book. How motivating is that when you lose the pattern book? I didn’t remember where I left off on my knitting and then I couldn’t even remember where I put the pattern to try to find out where indeed I did leave off! Pitiful I say! But how many times do we discover that it is harder to get restarted on something after a long dry spell? So many things can get into our lives to distract us from things we love. When we do try to go back to them, sometimes it can be exhausting, frustrating, time consuming or confusing to pick up the pieces. Even if you are doing what you love in a much smaller capacity, try to maintain some involvement as time goes on. Getting started from stopped is much harder than picking up speed on car already in motion! Secondly, I realized that a big project is really just many small parts put together. When we see big tasks, we tend to get hit with the feeling of being overwhelmed by its’ vastness. Sure a project can be big, but looking closely will reveal that everything can be broken down into smaller pieces. The sweater was in fact comprised of four pieces- the body, two sleeves and the finishing job. When we look at a task this way, it doesn’t seem so big. How many things in life are like this? Small mundane things and really huge life issues are both easier to tackle in small pieces. Cleaning the house for company, or taking in a life-threatening illness of a loved one. Take it in small bites, one moment at a time, and you will come to see that those moments flow into hours, then days, then months and you are making it through. Lastly, the immense feeling of accomplishment is incredible! The gratification in a task conquered is wonderful. The satisfaction of putting on something that I created with my own two hands, and know that it makes me feel proud, is priceless. I feel like Rocky Balboa when he reaches the top of those stairs and punches his fist into the air in triumph. I feel like with this conquered, I can do anything! It’s such an exhilarating encouragement to find a major obstacle overcome. It’s empowered me to finish other projects that have been on the back burner. There is a mental block when unfinished business is left. Like a computer processing a background program, I believe we might be spending energy on many things that we should resolve and live our lives lighter. Unfinished projects. Discarded dreams. Unforgiveness and grudges. Some are easy to tackle and others painful and deep. The Bible talks about how hard it is to go around pulling a speck from a brother’s eye when we have a plank of wood in our own eye. What a metaphor! When those things are cleared from our vision, imagine how much clearer we can see. How much farther we can dream. How much more we can recognize and respond to our own hearts and others around us. This sweater has taken me on a journey. Looking back at the first reflections I wrote nearly four years ago, this sweater has been knit on while I was a girlfriend, then fiancé, and now a wife. I have learned a great deal about life in these past few years, both in my understanding of who I am as an individual and how I can grow into these new roles in life. Change always comes, and through it we grow in understanding how to become more like the person God wants us to be. I can point out places I’ve been with this sweater, people I’ve been with, memories I’ve made and mistakes I’ve made. Yet at the end of the day, the overall picture is something warm and practical, something that makes me smile proudly. Isn’t that what our life should be a picture of? A life well lived is full of reflections and memories. We as humans should doing more than just checking off calendar days from cradle to grave. We have a purpose to live a life reflective of our Creator’s grace and beauty, while using our talents and gifts to bless the world around us. In the end, I hope my life is something that makes Him smile proudly. So as I fold up my sweater tonight and tuck it away for another day, I’m tucking these treasured wisdoms in my heart. Everything has a story to tell us if we have the ears to hear! I have been knitting a sweater for a very long time. Some of you who know me know of this sweater. And know of it's saga. The pattern is "Ambergris" by Ann Weaver and the pattern is from her book White Whale. The yarn I got at Vogue Knitting October 2012 and it is a hand dyed superwash merino, DK weight. Somewhere this fall I got this crazy notion to start a sweater. I did not need to have one more thing on my plate. I do not need one more distraction calling me away from the laundry needing to be folded, the dishes pilled aside the sink or the stack of paperwork needing attention. I didn’t anticipate the distraction that this sweater would cause, the excuses I would make to myself and others about the time I was spending on knitting a sweater I could have simply marched out to the store and bought. Ahh, I tell myself. It’s not the kill but the hunt. Not the product but the process. We all really just know it’s about that yarn. That yarn. Sigh. Like a temptress luring you away from reality it sits on the shelf. You try not to touch it and yet the color excites you and one touch and you melt. Me, being the methodical and practical little gal I am, reasoned with myself with why I shouldn’t have it. But alas the yarn won over, and with a quick and hasty decision and the help of a little plastic card, that yarn was now mine. That yarn and a pattern for a sweater. Not just any sweater. No sir. I had ambitions. Cables, lace, charts, markers, counting; the whole nine yards stared me in the face. But I had gusto and enthusiasm and plunged in naively and excitedly. The thrill of the newness, the challenge, the unknown invigorated and motivated me. I counted, cast on, placed markers and started in on my adventure. Thrill of it all made it go quickly. The beginning was simple. Ribbing flew on those needles and I was ecstatic as I watched my sweater grow. I was smart enough to read on though. I knew what I had coming for me. There were rough waters ahead and I was bracing for it. I figured on just figuring it out as I fumbled along. I was determined and resolute that nothing would pull me down in creating this sweater. By now this was not just a “sweater” but something of a Picasso. My little masterpiece. The easy gave way to more challenges and my suspicions were met. I did face challenges; challenges that were beyond me. I asked around and got advice from seasoned knitters. They even helped me swatch and shared and taught me not only with words but actions. I clung to their advice and my needles, and through the toughest patches overcame the obstacles. Now my sweater was onto a new phase. The newness worn off, the excitement now simmering in quiet resolve, my sweater was in the long-haul stage. By this point I was beginning to recognize the pattern, the stitches and the rhythm. Knitters know this point. It’s a moment of jubilation when you quietly realize you are sailing along with a smoothness, almost becoming one with your project. The click clack of the needles, the yarn slipping through your fingers, it all feels so comfortable and certain. You see progress and growth and the yarn, the large ball now dwindling, is transforming swiftly and beautifully into that sweater. The dreams in your head are becoming reality as each inch of yarn glides through your hands. This is just the body of the sweater. You know there will be sleeves, possibly pockets, trim and more. Sometimes these other parts feel like you are relearning the process all over again. There’s new challenges as you decipher through the increases, decreases and other stitches along the way. At times these might even feel like they’re unrelated to the sweater I started with, like taking a path leading off the main road. It seems like a distraction or a different direction. However, I know that it is all a part of making this sweater come together. The pieces will fit together. The pattern says so. The designer knows so. I have to trust it to be that way. When I finally complete this masterpiece, I realize there’s so many hours of my life worked into each tiny little stitch. I can look back at this sweater and think about memories tied into each stitch. It’s almost like flipping through the pages of a journal. Reflections on life, thoughts, hopes and dreams are interwoven through the yarn. The sweater is no longer just an article of clothing but a mirror of life. All this time during knitting, made me reflect on how marriage is much like the process of knitting a sweater. The fresh allure of a relationship is similar to the call of beautiful skein of yarn. It’s all warm and fuzzy and exciting and we can’t wait to jump in with all enthusiasm. The beginning is easy- you discover each other and their likes and dislikes, what makes them tick, how you can get along together. Much like the ribbing on my sweater, those early years are full of easy, simple work in your relationship. The happy glow of excitement casts a rosy essence on the memories we reflect on. We do know that there are tougher waters ahead. Others have warned us; perhaps we’ve experienced it as children watching our parent’s marriages. That territory can be brought about by any number of circumstances; some that we can control, many that we cannot. When we know that hard times will befall us, we can make a choice early on. We will abandon the project, knowing that the sweater will not meet completion but remain another unfinished project to be stuffed into our closet, or we can resolve that no matter the challenges that face us, we will work through it and stick to the goal of completing this sweater. In knitting, we know that the intricate patterns and complex stitches are achieved only through perseverance, dedication and commitment. So it is in the process of marriage. We can ask for advice and wisdom from seasoned veterans, but we must decide before the tumultuous times that we’re going to follow through to completion on the process of life and the journey of marriage. Life deals out diversions and distractions, just like pieces of the sweater that seem to fit awkwardly into the puzzle we’re putting together; yet all the while, we know that it is all there for a purpose. It’s all a part of the pattern. We have to put our faith and trust in the pattern writer. God’s been writing patterns for how to live life for generations of people to fall back on. It’s all there for the taking. His advice is more than helpful suggestions; it is time-proven wisdom from the person who knows us best- our Creator. He’s designed us a certain way and has given us a pattern book so we know how to take each step wisely. When we combine all of this together, we cannot help but create a masterpiece. Though it may be a journey, we know that it is really all about process and not the product. We don’t embark on marriage because of a sparkling ring or an elaborate wedding. We don’t knit sweaters because we don’t have the means to go out and buy one from a store. We embark on both adventures because it is the moments that matter and when it is all done, we’ll have something wonderful to look at, to cherish and to warm our hearts and souls. It’s the way the designer wrote the pattern. This cowl is a favorite of mine. Nuno felted and made with habotai silk, it has a touch-me-kind-of texture. I love the way the heavier fabric creates so much more surface dimension. It does take more effort to felt it, but every time I look back, I feel it is worth it. This was a seamless piece, meaning I used a resist that the silk was wrapped around. The seams are covered with wool so no sewing is required! 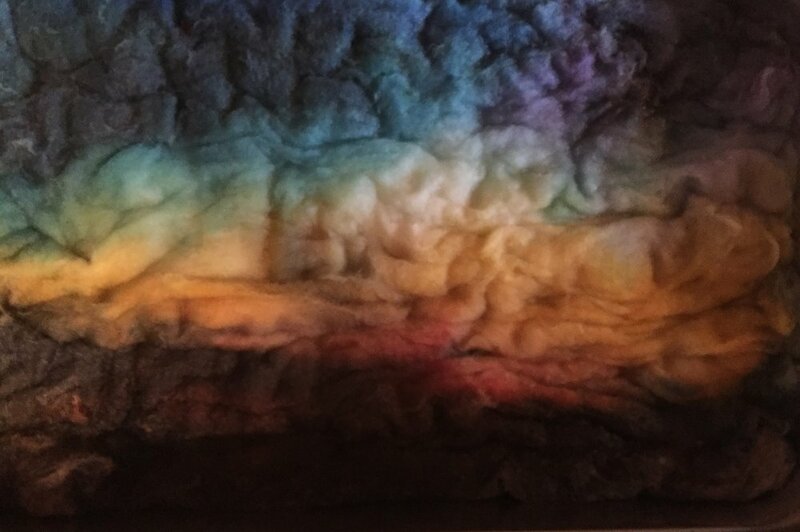 You might recall that I originally got into nuno felting because of the no-sew-allure. But alas, it led me to sewing, so the joke's on me I suppose. I love trapping sequins in the surface of the nuno felt. Laid on top of the silk and trapped by my top layer of wool, this was a technique I first devised as a method to - gasp! avoid sewing! I first did this on a beautiful holiday poinsettia shawl with tiny red sequins. The sequins are more to decorate the back rather than the front, as they rarely show through the wool. However, with a flip of the scarf, you see the delightful back of it and the surprise of sparkle rewards. I like to have the back look just as appealing, especially on a scarf, because I know that despite all efforts, scarves will flip flop as you wear them, and with a little added effort in the design stage, the back can be beautiful too. You can even wear it reversed for a subtle color with texture and sparkle. It's a nice option to wear it with a print or something busier, when the occasion calls. My surface design is full of wonderful autumnal colors, sparkle thread (I love that thread with baby sequins on the thread! ), curly Lincoln wool locks, and Angelina sparkles. All those fun additions were trapped by gossamer layers of wool on top, and the result is little bits peeking through. It reminds me of glorious fall days where the sun is warm but bright and makes the morning dew sparkle on every fresh turned leaf. One of my favorite seasons! The felting process totally transforms it, breathing life into and merging my fibers together so now these two very different materials are made one. It's truly miraculous, and yet so very simple. Soap. Water. Rhythmic rolling. It's then that I am alone with my thoughts and my art. It's very relaxing and rejuvenating. When I am done with this process, something beautiful is born, something transformed. I will be honest. When I finished this, I did like it but something was not quite right. It didn't lay right on your neck and I didn't want to do what I knew I had to. So like all things, we put it away. For months. All projects do not end in artistic brilliance. I love it when they do! I feel like the heavens open and a host of angels sing the hallelujah chorus and a beam of sunlight shining down. But for the rest of those times that are slightly less glorious, I put on my thinking cap. Truly, not much of my work is done the minute I finish felting. Sometimes there are alterations and more felting to follow. Sometimes there are embellishments, like beads added, or thread painting done to add interest. Sometimes things just sit until I can think up the next path. So I did what I had to do. I cut it. Nooooooooooo you say, as a scream of anguish is let out. Cut!?! What!?! Isn't there some other way? Some other option? Sooner or later, we all attack things with scissors. and ack, it wasn't that bad after all. Move slow and deliberate. Remember every flaw and mistake is just a design opportunity! (She says shakily with scissors in hand!) I cut that cowl and added a twist and sewed it back together. An expert surgeon making wrong right again. It worked and that cowl was more beautiful than ever. I added a really fun pin made with... guess it.... leather from Shibori Soiree. I even used some felt to make a "feather" which I really loved, along of course with real feathers. Some dangling charms and crystals and it was complete. The pin is removable for washing, a feature very important to me. I loved that pin and definitely want to play with more of that style and fabric combination. This piece was shown at the Fine Art of Fiber Fashion Show at the Chicago Botanic Gardens this fall and is in the boutique at Esther's Place. So my lesson to you is to do what is best for your art. You might scream a little inside, or It might scream a little at you, but it's not as scary as it seems. The true test of an artist is their ability to take things to edge even when it pushes them. That's when we grow and expand and our world broadens. Habotai silk is used in this richly textured nuno felted cowl that makes a lovely accessory for brisk fall days. Dress it up with a chic leather jacket and boots or wear it with your favorite colorful jacket. It's easy to wear and beautiful with dazzling fall colors and sparkle. The feathered brooch accents delightfully and is removable for easy care. What a great seasonal piece for your accessory wardrobe! Sometimes I need to change it up. I get stuck in creating old classics- styles that are loved and adored and sell well. But there are new classics to be found and discovered! And that was my ambition with this piece. I needed something new and interesting. Trendy and chic. Where do you go for inspiration? PINTEREST!!!! Yeahhhhh.... five hours later and a few dozen pins for things like chocolate caramel brownies, felted flower brooches, diy kitchen hacks, and more, I came up with the "it" item of the season. The sleeveless blazer or long vest. Bridging two seasons and many decades of fashion style, it's cute! My goal was to make a more artistic version of this style. A lot of nuno felted vests seem to be one size fits all and have a flow and swing to them. I wanted something more tailored and heavier, like a wool fabric rather than a gossamer nuno felt. I did calculations for drawing out a resist- a piece of plastic that goes inside the piece so I can create a seamless garment. When calculating, it has to be a third larger to allow for shrinkage. Basically, my resist looked like an extra large hospital gown. But I've done this enough times to not lose faith. Starting with a ginormous piece of bubble wrap and two large tables set up in my studio, I set out for this adventure with gusto. First layer: charcoal silk gauze. Second layer: turquoise merino wool laid in thin wisps in one direction. Third layer: blend on the drum carder shades of turquoise into navy into dark green into charcoal into black with bamboo and firestar intermingling. Fourth layer: embellishments of yarn, silk pieces, bamboo and more on the bottom of the front panels. I was very fortunate to have some help from my friend Jodi on the wetting and rolling process. This is quite the process, and many towels get used. It's a real exercise rolling as many as 1200 times or more to fuse the fibers to the silk fabric. This agitation forms a new fabric and causes the overall shape to shrink. At the very end, I cut the front down the center to make the vest. This is such a nerve-wracking moment. You know you have to do it, but cutting an intact piece still causes beads of sweat to form on my brow. But it's always best to cut at the end so you form strong felt, so it must be done. A little more rolling, slamming and kneading and it's transformed into a sleek, styled garment! Now for the finishing touches- the collar, beading, shaping and more. These little details can really make the garment. Sometimes these details are the last to go on, or even get foregone for lack of time or patience, but you know the true artistry when you observe them. This piece has been in the Uncommon Threads Fashion Show in St. Charles, IL and Fine Art of Fiber Fashion Show and is available in the boutique at Esther's Place. A fushion of hand dyed silk fabric and layers of wool blended with bamboo and firestar, this elegant piece is perfect for every occasion. Wear it with skinny jeans and a tee for an afternoon of shopping or with black leggings and accent jewelry for a night out. The contrasting shawl collar and pockets add to the fine detailing. Light yet warm, it changes with the seasons. It's been a fun month traveling to different places spreading our love of fiber arts. I got to enjoy a wonderful time with my husband at the Wisconsin Art Educators Conference in Lacrosse, WI. I had never been to Lacrosse, which is on the Mississippi River, so I enjoyed the beautiful fall drive there. I think that Wisconsin always picks the most perfect time of the year for their conference, when the leaves are at their peak of color. It was spectacular. We saw bluffs and rolling fields and forests ablaze. Such a feast for the eyes. When we were there, we discovered Grandad's Bluff, which was pretty unique. A natural limestone bluff that had been preserved since its' limestone was quarried in the early 1900's, it's a stunning 600 feet above Lacrosse. Equally stunning was the fact that I had a donut burger there the first night. Yes. It was delicious. The town was cute, with lots of bars and eateries. The little ice cream and candy store was adorable and the ice cream was homemade and wonderful. A fun place to explore during the conference! We had a fabulous time making candy corn at the demo table at our booth. We had some darn creative folks who even added faces to their candy corn! Jonathan was a delight, reminding me just how much I enjoy working with him. He's a pretty great felter and a superb fiber sales man. In fact, he's even got a sense of humor. When someone was adoring a blended sparkly batt in soft pastel colors, they commented that it looked like unicorns. To this he answered that it was unicorn fiber indeed, as we curry comb our flock and then make the batts from that fiber. Gotta love it! I had two back to back filled classes in which we made little "leapfrogs" with needle felting and wet felted flowers. Everyone had a fabulous time. We actually for the first time sold out of fibers! I felt like Macy's on Black Friday... I had people waiting, arms weighed down with fiber in our checkout lines! What a great feeling. So thank you fabulous Wisconsin Art teachers! Do keep felting, and share your creations with us. It's so inspiring! We look forward to seeing you next year in Fort Atkinson, WI! To another place AND another time zone this weekend! Well it wasn't far from home, but our neighbors Indiana, for their art educator's conference. Held in a suburb of Indianapolis, at a high school (great idea by the way! ), we had the treat of sharing fiber with a bunch of excited Hoosier folks. After a three and a half hour drive, it makes you feel pretty good when you start unloading your things and teachers walk by and literally start cheering that Esther's Place is here. I mean clapping, hootin' and hollerin', and everything! What a welcome wagon. The day started out with my class first thing, which I really liked. We made leapfrogs and trumpet flowers to demonstrate wet and needle felting techniques. What an awesome feeling when you keep watching people trickle in and you run out of seats. I had standing room only and I think almost 30 teachers in the class. I was very pleased to have three male teachers attend. I strive to minimize the genderization that sometimes subconsciously occurs with fiber art, and having confident male teachers helps that cause out! The class was great but my favorite part of class is when we do introductions. I really like to get a group of people to learn about each other and find common ground that gets them sharing. In this instance, they share their name, where they teach and what ages, and I ask them to share their passion. Art teachers are artists first, and their insatiable desire to create sometimes gets pushed aside for the practical. Hearing about their passion, whether it was blacksmithing, stained glass, mixed media, etc, was inspiring. We really needed a session or social media platform just to share pictures and ideas and interact about what we do, and learn from one another (hint, hint!). The booth was hopping, of course, and thanks to my dear friend Amber, lots of folks were making super cute candy corns! I know there will be lots of creativity going on, because lots of fibers went home with new felters. I did enjoy seeing one gal, Kendra, who shared with us the picture of her felt rooster she created. She won a grand champion for it at the fair! How exciting to see what can happen in a year. The show was a great success and I now have lots of things I want to offer for art educators- resources, lesson plans, video tutorials, that I will be working on in the weeks to come. In the meantime, check out how to make the leapfrog and flowers here! Well, a trip isn't complete without a little fun, so we did enjoy some local sushi and I visited my favorite Indy attraction, Saddleup Saloon and Dancehall, where I enjoyed my pastime of line-dancing with some boot-scootin' fun. I love dancing, have danced my whole life in some form or another, and dance at Saddleup near us. It's been a great trip! I will admit it. I am a bandwagon fan. My brother has been a true Cubs fan, the one who through the most major sports drought in history, kept believing. Kept cheering. Kept watching. It's admirable. Really! He's got the jersey, he's got the lingo, he's genuine. As I watched the team rally together, and watched the fans join in harmonic support, it was truly inspiring. In light of the current political environment of slander and negativity, the fact there was something we could all believe in together felt surreal. It felt patriotic! There was a feeling of unity as we saw the impossible becoming a reality. And then there was that 7th game! What a nail-biter! What a victory! And we all celebrated with them. Why? Because when an underdog wins, all of us other underdogs feel a fire stir within us. I feel like I am an underdog at times. Art teachers. Farmers. Small Business Owners. Even the lowly sheep. Those who swim upstream in the river of societal culture. We're all underdogs. Yet watching the Cubs, I realized so many things. Deep life lessons. Teamwork. Dedication. Belief and faith. Talent. Persistence. Discipline. Passion. Here are the traits of success. The Chicago Cubs have reminded us how to dream and with all those attributes, how to dream big. Congratulations on making history! We celebrated their win at the Illinois Art Educator's Conference in Normal, IL . Here art teachers gathered from around the state to learn, share, inspire and engage in their passion of art education. For me, art teacher conferences are like the World Series of my year. Something I look forward to, something where we can all celebrate together what we love doing. Where we get support and a shot in the arm to keep going. Art teachers are really the best! It was fun hanging out with all of you and getting to celebrate our victory together. And especially fun was creating and crafting with you, Cassie Stephens, another kindred spirit who loves life, fun, fiber just as much as me. She's a great resource with her art teacher blog and an awesome person to know. So on behalf of all the underdogs of the world, we congratulate the Chicago Cubs on winning the World Series after 108 years! If this is possible, ANYTHING IS! Dream big my friends! Why sometimes, you just have to stop because something is beautiful. That was the case with these little treasures. Called "Sparkler" Radishes, they have such great colors, don't they? I was picking for the CSA one morning and as I lined them all up, they just were glorious. I really love things that are bundled, tidy, neat, and arranged. My life isn't always like that, seldom even comes close, but I can still enjoy it. I can enjoy it through the pages of a Martha Stewart magazine, or through the aisles of the Container Store, or even in a minute way in my closet as my clothes are hung by color. I can even get that fix in the radish patch, where for a tiny little moment, all can be trim and tidy. I love that feeling! We get it in so many ways, be it a clean counter top, a satisfying meal made well or an accomplishment checked off our list. They are small in grand scheme of things, but feel wonderful to us. So before I took in the radishes, I snapped a photo of that pile. The soft morning light cascaded over them and the bright red barn made a cheery backdrop. What you might see is a simple pile of radishes. But through my eyes, they are "radishingly" beautiful bundles of plucked perfection! For heaven's sake, look up! The skies this week were beautiful. So much to behold. So much they tell. The heavens really do display the splendor of God. They are so majestic, they can only be but a bit of the majesty He contains. Every sky is different. No two are the same. For heaven's sake, we should be more mindful of heaven. There are things that cause us to keep our eyes downcast. It might be the preoccupations of a busy life, a deep tragedy, trials and troubles, or even just too much technology that we're glued to. This week a dear family experienced a loss so sad and so sudden, it made us all reflect a little more. At the burial of this little boy taken far too soon, we all released balloons into the sky. Bright, cheery colorful balloons that drifted their way heavenward made heavy hearts lift, made smiles come to the corners of quivering lips, made tears dry as the wind swept them away. One by one they made their lift to heaven, and I hope that sweet little one was up there catching every one as he runs the fields of heaven. With our eyes to heaven, we watched the last balloons disappear and we were left with a blue sky. But that sky isn't always blue. The sky in the picture beneath has powerful light but with that light comes many shadows. Look at the dark cloud that covers the brilliantly illuminated cloud. Isn't it like that in life? A shadow comes and steals away the light far too quickly. For heaven's sake, sometimes things happen we don't understand but we can look up at the clouds and read the little stories God tells to us. You see cloud watching isn't just for kids, there's life lessons laying in the heavenly realms. Skies are His storybook! Some of my best musings are done in a quiet morning garden. The air is cool before the heat of the day, the grass still dewy and my mind focuses on my tasks ahead. But somehow, in the midst of my mind churning with the to-do list, the garden always beckons me to be still. God talks loudest in these moments. It is like all of nature is a storybook for our lives, filled with rich lessons in the words of its living pages. We learn such endearing lessons here, and it is here we really see how simple His ideas for life are and how complicated we've made it. As I came to the arugula patch, I started methodically cutting and sorting the row for the day's picking. Somewhere in this zen-like meditation, I began to realize some very important truths. Take a look at that patch of arugula. Six rows, all different stages. Some cut and regrowing, some freshly cut and some to be cut later. Each stage is essential. Each stage the plants have experienced. It was then it hit me, and I understood the lessons of the arugula patch. Sometimes life is like that full row, waiting to be cut. It's waiting. It's so hard to be in this stage. You are so ripe for something to happen in your life! You are waiting for that special something or someone, you are waiting for direction or guidance, you are waiting for forward progression. Life is bountiful and full, but you are ready and done with the waiting. Othertimes life is like that row that is regrowing. It is fresh and alive, growing back better than ever. The leaves are tender and small and tasty. The hurts are past and this time of regrowth can give us a fresh perspective, a fresh hope and a fresh look. We gain confidence in ourselves and the world around us and are ready again for to be picked. But sometimes we have been cut. Severed. Scarred. What is left doesn't look pretty. Discarded leaves, weeds, torn and ragged stems litter the dirt around us. There is nothing left to offer, nothing left to give. This will take some time. This will take some tending, some rain and sunshine both, to let us grow again. The Good Gardener who tends us knows all this. He knows there are all these stages in a thriving garden. A good garden that has sustainability exhibits all of this. A good garden that endures must go through all these experiences. He is aware of this knows this when He plants the garden in the Spring. His tenderness says, "Child, you will flourish. In your time in life's garden, you will know much joy and much pain. Know I am watching and lovingly tending to you through it all". So when your heart is still and your ears are open to listening, even the humble arugula patch can be a place where He teaches you the lessons of life!